How do we think of a name? Well it’s orange and it’s a winner – job done! Glowing orange blooms which look great with lobelia Cambridge Blue. 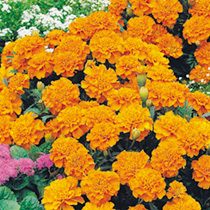 Large, long-lasting, crested blooms of gold shaded orange. Height 20cm (8"). HHA - Half-hardy annual. Double flowered giant crested variety. Early flowers with weather resistant, boldly curled and crested centres. Ideal for beds and borders, patio pots and containers. Drought tolerant. Prefers full sun. Needs a sunny position and will continue to flower throughout the summer.